This was a Christmas present from my mom and the girls were so so excited! We also took down the Christmas tree today and packed away the Christmas ornaments, the nativity scene, the stockings and dime books, the platters and cookie cutters, etc. I just need to go take the bow off the mailbox! This year I'm determined to keep the ornaments more organized so we are putting them in the Christmas cookie tins. We only use those tins at Christmas time and so why not? And with a layer of tissue paper in them, they're perfectly tidy. And the ornaments aren't piled on top of each other in thick heaps with the ones on the bottom of the bin getting broken. Today I also went dumpster diving in the big pile of cardboard behind the hardware store and got some extra large cardboard for our Ark! We also went to Jo-Ann Fabrics and got some great scrapbooking papers (barn wood, hay stacks, a thick textured paper in "java bean" color, and a pack of 14 thin sheets of real cork). We already have burlap 12 x 12 paper leftover from the 2017 Homemade Calendar project. We can't wait to get started! Dinner is Easy Enchilada Casserole and if, like me, you get home from the grocery store and realize the one thing you forgot to get is enchilada sauce, here is a recipe for the spices which go in enchilada sauce. You can just doctor up a few cans of plain tomato sauce. This dinner recipe is a good use for that package of 6" corn tortillas! Brown 2 lb lean ground beef. Drain and set aside. Reduce heat and simmer sauce 5 minutes or until heated through and slightly thickened. Grease a 9 x 13 pan. Have ready the ground beef, the sauce, a bag of shredded Mexican cheese blend, and the package of corn tortillas. Bake uncovered at 350 degrees F for 20 minutes. These are older recipes and I'm having a hard time finding them online so if one of them sounds good to you, just ask, and I'm happy to type it up. We are celebrating Becca's birthday (which was on the 11th) on the weekend so that it can be more relaxed. That and my mom mailed her box of gifts late... and I think her sisters forgot to make her something in time. I was ready. But I think I was the only one! She loves the herbal medicine classes with the master herbalist at Dayempur Farm each week, so I got her two books about herbal plants and the 12 Half Bar Handmade Organic Soap Sampler Set of wonderful handmade soaps by Sweet Sally's Soaps on Etsy. She can use her books, plus my books about essential oils, to see what each soap would be good for! I think she will have so much fun researching it all. Plus she and I are also going to make Nourishing Tallow Hard Lotion Bars with Essential Oils together using the tallow that my friend Lark gave me. Thanks Lark! Becca's party is tomorrow at 1 pm, after I teach my Creativity Workshop, and her teenage sisters planned it for her. It is a "Sleepover" Theme. They have so many creative ideas, and I think it's really sweet. Her birthday dessert? Homemade chocolate tapioca pudding. You know it's a labor of love to stand at the stove and stir pudding for half an hour. And they've always wanted to try the chocolate version from the back of the box. Tomorrow is the day! 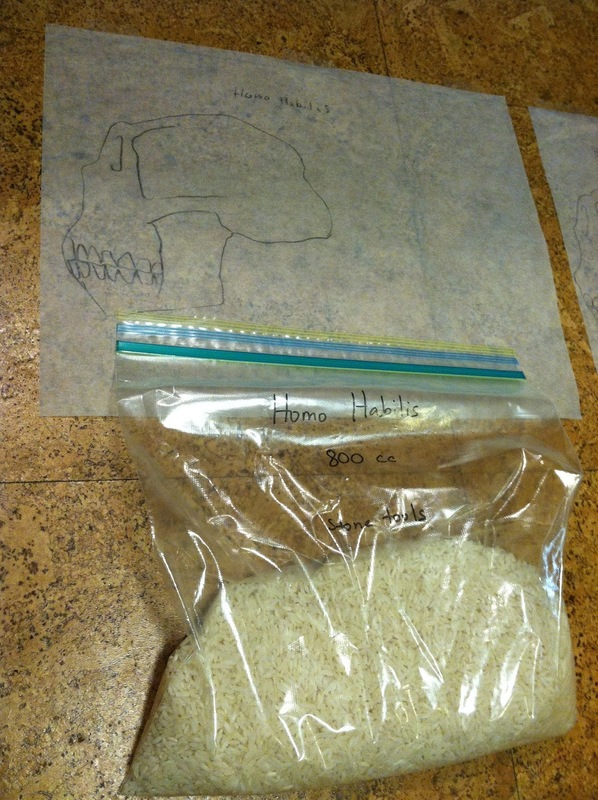 Today I wanted to post our pictures of the skull activities we did for the Early Humans topic. We didn't make a main lesson book for this. 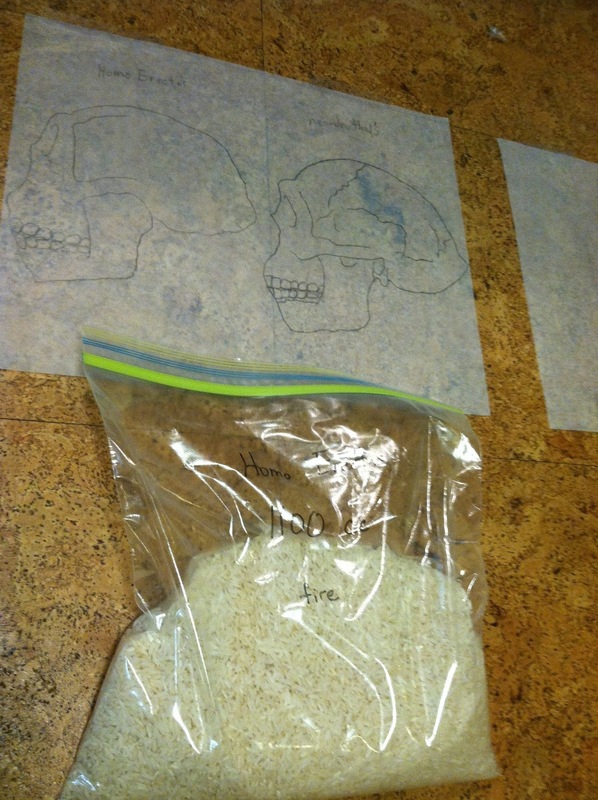 We completed the graphic organizer, made a chart comparing the heights of each hominid, and traced each skull and measured the size of the brain using rice. The size of the Neandertal brain, and the Cro-Magnon brain, was the same size as the modern human brain. 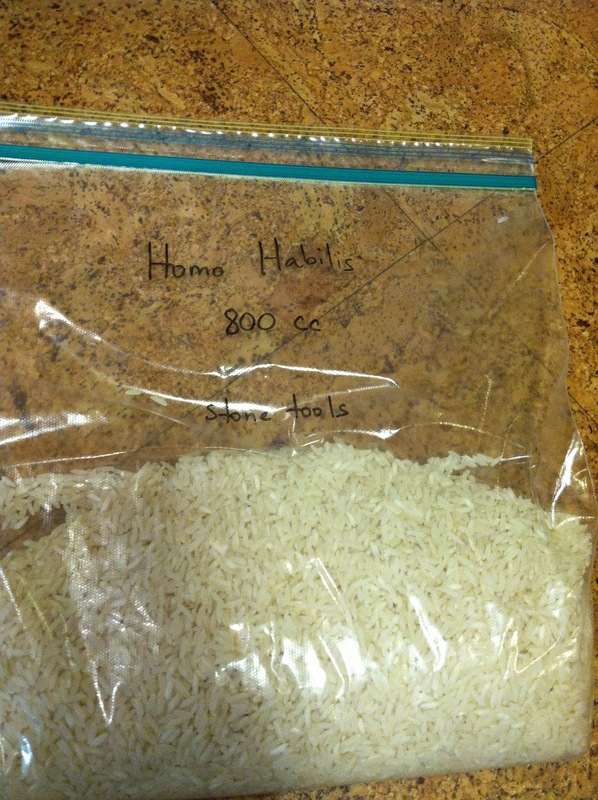 There are other hominids which have been discovered since the Early Humans book we used was written, but I still really like it as a starting point for this lesson. 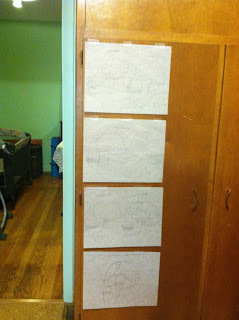 You can see that we just taped each skull up to the door of the pantry as we traced it. 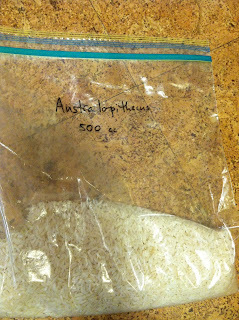 We had the bags of rice displayed on the kitchen table. 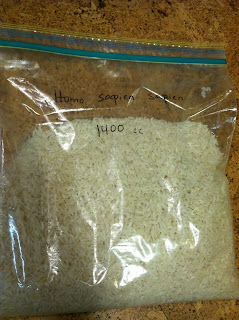 I liked the rice because you could feel the weight of each bag... but it didn't work as a side by side comparison very well because the rice moves around in the bag when you lay it down so some of the bags look the same. You can't really see that there's more rice in the bag. 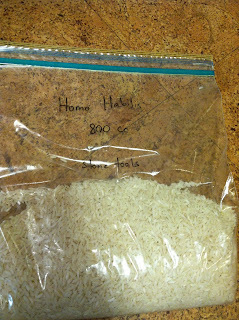 I think next time I would do the bags of rice AND jars of rice. 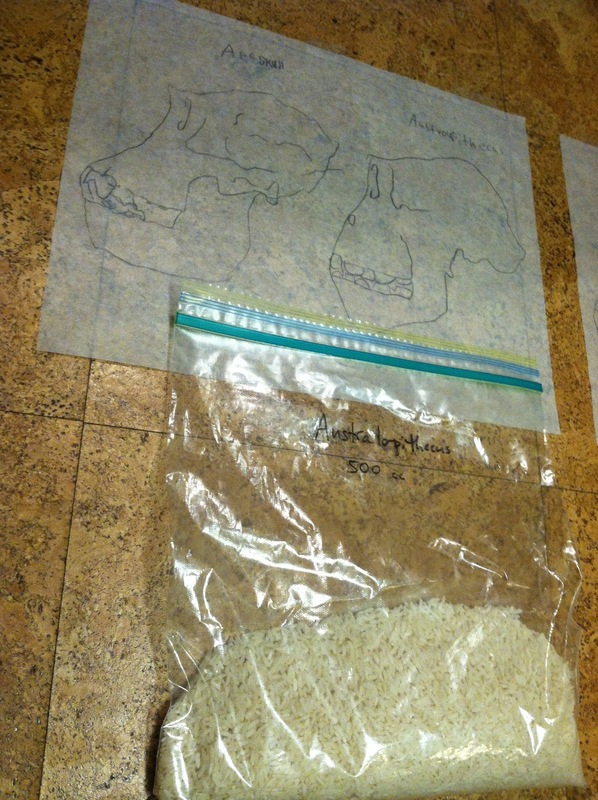 You could also do one large jar and put lines on it at the level of each brain size... and as you learned about the next one you could add more rice and mark a new line. But I think a display of side by side jars would be nice. Brainstorming now... maybe you could even do different colors for each jar. Like how people dye pasta shapes and dried garbanzo beans in rainbow colors for sensory play (that's another subject). 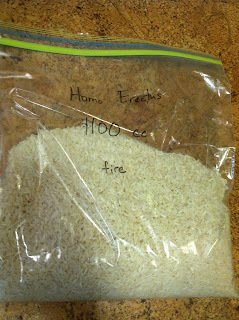 If you go with the bags AND the jars idea, you'll need four five pound bags of rice. And your jars will need to each hold 1.5 liters. Or go ahead and start building up your collection of scientific supplies for 7th grade Chemistry, and get 1.5 liter beakers! This is probably ultimately what I'll do. See how they all sort of blur together? I noted "stone tools" on Homo Habilis and "fire" on Homo Erectus. 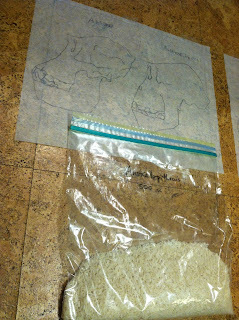 If we made a rice bag for Neandertal (1400 cc) it would say "religion and art." There is still quite a lot of discussion about when and where the first farming began, but 8,000 BC is a comfortable guess. 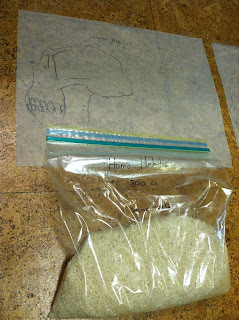 The stomach contents of the 5,300 year old fossil Otzi included einkorn wheat bread. This was the first cultivated wheat. His leggings were made of domesticated goat leather.